Concord Foods is proud to announce the launch of its new product line, Concord Fresh Success, a variety of seasoning and smoothie mixes with no artificial flavors, colors or preservatives. 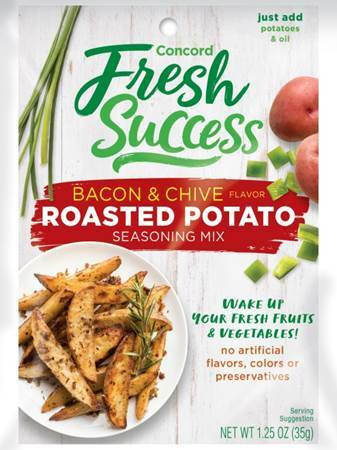 While the company has been providing convenient, flavor enhancing meal solutions to busy shoppers since 1968, the Fresh Success line takes these solutions a step further by removing undesirable additives. Consumers can enjoy a wide variety of sweet and savory options including guacamole seasoning, salsa seasoning, roasted potato seasoning as well as an array of fruit smoothie mixes such as banana, strawberry, chocolate banana and orange. With this new line, the brand hopes to inspire busy moms to serve their families more fruits and vegetables in a variety of healthy and tasty ways. For more information on Concords Foods, please visit http://www.concordfoods.com/ and follow the brand on Facebook, Twitter, and Instagram.